Modern Makeup styles male model for special paint night event in Mississauga. 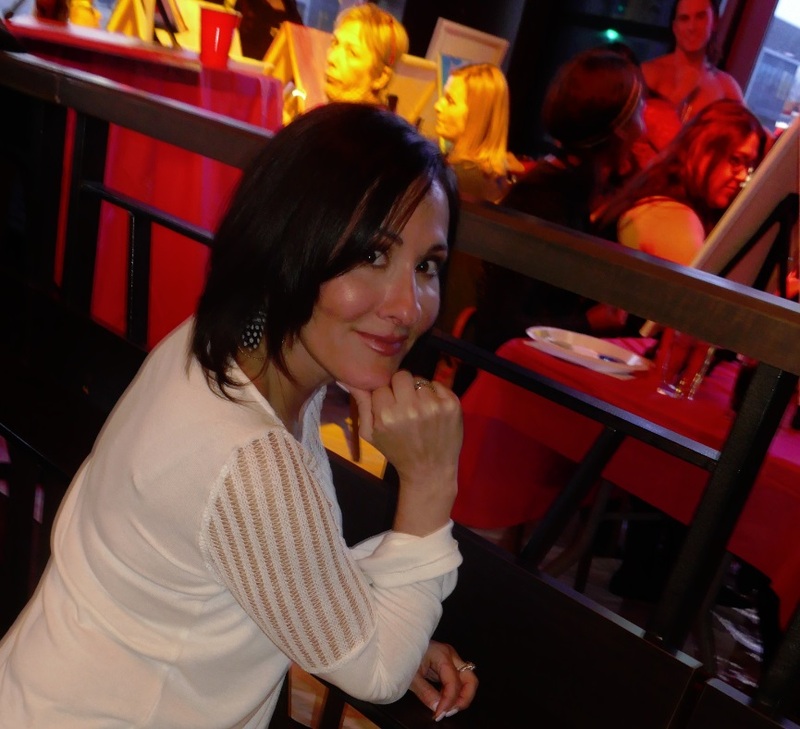 On the evening of Thursday April 5th, I helped Laura Bilotta, AM 640 Radio Host of Single in the City stage a new event she calls Wing Woman Paint Night. More specifically, I was hired to apply make-up to the subject’s face and upper body. But in truth I also made his costume and styled his jewellery! Laura’s event happened at The Port House restaurant on Lakeshore rd in Mississauga. As I arrived in the venue I saw her people setting up tables and chairs in the open square that would normally be called the dance floor. At six pm, I watched her crew lay down huge plastic drop sheets and break out a dozen easels and small white canvases for twelve painters. The diverse array of wing-women painters bonded together in solidarity in the shadow of a major stud muffin while receiving instruction on how to paint from Julia Chatterji of The Studio Paint Bar . The main attraction that evening, besides Laura, and Julia, was Martin Dasko. This finance blogger pens a popular portal called Studenomics. A place for students which dispenses useful advice and motivational wisdoms. At six thirty pm when Julia was clearing the dancefloor to set it up as a makeshift paint studio, I made my own make-up station was at the end of the main bar – nobody seemed to mind that I had three stools and Martin in a fourth. The area behind these stools became a makeshift dressing room when Martin peeled off his shirt and pants and donned the leopard loincloth. Martin had pretty good skin so I didn’t do much to his face. I brightened up his under eye area and hid a bit of redness. He had never had his makeup done before so he wasn’t sure what to expect. Luckily he trusted me and I didn’t make him look ridiculous. Laura wanted me to oil Martin’s chest but instead I applied a little bit of extra shadow and highlight to showcase his muscles. Martin’s costume came with some assembly required. Modern Makeup styles for a lot of the photo shoots you see our makeup in. Originally the loin cloth was more of a Fred Flintstone style smock, but Laura nixed the shoulder strap ; she felt it was important to keep his chest exposed. I got Martin’s costume assembled in the middle of the restaurant. As a favour to Laura, a swanky Toronto jewelry store sent along about four thousand dollars worth of silver bling for Martin to wear. There was a gorgeous necklace, two bracelets, and a thick silver skull ring which was a little too large. The staff at The Port House restaurant were fantastic, and Brian the manager is outstanding in his attention to detail. When Laura decided that Martin needed something hold on to, Brian quickly found us a broom handle which became his spear. It was Laura’s idea to gather together a crew of confident ladies and discuss the tenements of being a Wing Woman. What responsibilities does a wing woman have? What role does this person play when they are helping another woman versus helping a man? 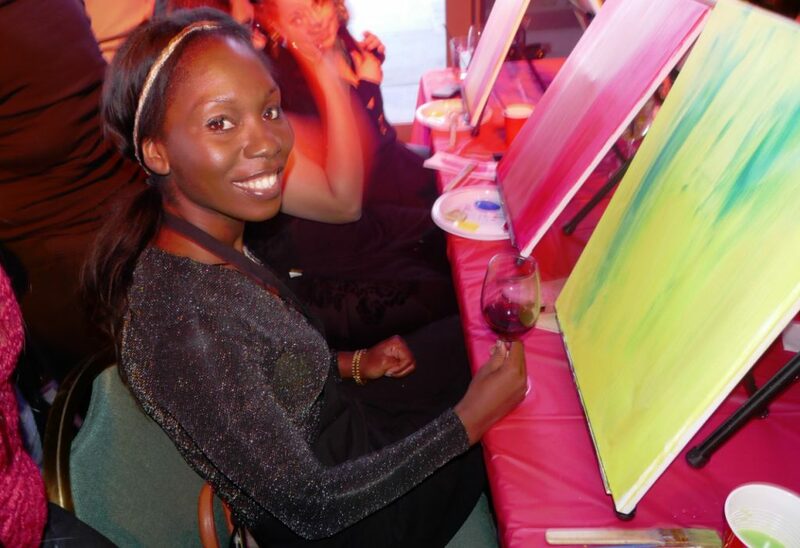 The Single in the City – Wing Woman Code of Ethics was unveiled as the ladies painted a handsome hero. A list of rules for single ladies that all must abide by! The disciples learned basic art skills they can practice forever. Five of the top painters got to take home a free frame for their work. Every attendee got to keep her art plus a generous gift bag filled with beauty bar coupons and cosmetic samples. It was quite a night! In addition to personal services, event makeup management is offered at Modern Makeup for large groups. Secondly, we have supplied makeup for groups of over 100 people in just a few hours. Especially relevant is the team is led by Modern Makeup owner Jennifer Turner. Please contact us to enquire for more information on your event makeup management needs. Tell us more about your event needs when enquiring. How many people will need makeup? What is the look for the day? Furthermore because we work strictly with professionals we do not supply makeup for unpaid events. Take a look at the portfolio page.